Home » Product Reviews » Top 5 Best Aloe Vera Gels For Beautiful, Glowing Skin. If you are a skin care fanatic like me, you are probably aware of all the buzz about best aloe vera gel for great skin. Well, it’s true that aloe vera gel can do wonders for your skin among other properties it comes with. In fact, the aloe hype did not start recently. This plant has been used for decades as a beauty product as well as for its medicinal properties. You are probably wondering, should I really bank on the store aloe vera or is it best to make my own? Well, in all honesty, the purest form of aloe is straight from the plant but in most cases, DIY aloe gel goes horribly wrong. The first and obvious reason is that preservation is a challenge unless you have a degree in biochemistry. Secondly, if you extract aloe gel wrongly, you may end up causing more harm than good to your skin. So, a safe, less tedious and less messy bet would be to purchase some store aloe. Just be sure it does not have any harmful ingredients. That said, if you intend to buy some aloe vera gel for your skin, you have come to the right place. 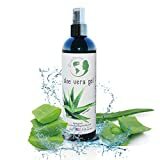 I will give you a boatload of benefits you stand to get from using aloe vera on your skin as well as the correct procedure of using it. 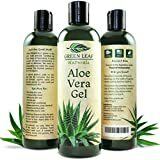 To top this all, I have compiled a list of reputable aloe vera gel product that you ought to consider buying. Enjoy! How To Properly Use Aloe Vera on Your Skin. 3. Reduce acne and scars. 4. Works as an anti-aging agent. 1. Amara Organic Aloe Vera Gel. 2. Earth’s daughter Aloe Vera gel. 3. Art Natural Aloe Vera gel. 4. Green leaf Natural aloe vera gel. 5. Fruits of the Earth aloe vera gel. Using your fingers or a spatula, ally a generous amount of aloe vera gel to your clean face. Let it sit for a minimum of thirty minutes. Rinse off and follow with a moisturizer. Many guys swear by sleeping with the gel on but if I were to give you my two cents, I would advise against it. For one, you will probably transfer it to your beddings leaving behind a mess. Moreover, aloe gel when dry is not only uncomfortable but can stretch out your skin. Besides, aloe is fast absorbing so an hour will be enough to get glowing, soft skin. To get a visual of this process, watch the video at the end of this post. Read More: The best vitamin C serum for face provides your skin with everything it needs to look refined, healthy, renewed and clarified. Aloe vera comes with a lot of benefits not only for the skin but for the whole body. The best part about all this is that it can be used for any skin type. So, without further ado, I give you benefits of aloe vera gel. If you happen to have dry skin, the good news is that you can turn to aloe vera for some natural moisturizing. The better news is, aloe vera does not clog pores and it moisturizes without leaving a greasy feel. This makes it excellent for use even by people with oily skin. If you are prone to getting sunburns, you know how hectic it can be to get rid of them. Studies have shown that aloe vera come with amazing healing properties that allow it to restore your skin in 48 hours. So, the next time you get sunburns, give aloe vera a try. As mentioned earlier, aloe vera does not clog pores hence great for use by people with problematic skin. On top of that, it comes with amazing antibacterial and anti-inflammatory properties that aid in the prevention of acne. It also contains vitamin E which does a great job clearing acne scars and blemish hence giving you a beautiful even complexion. One of the main natural anti-aging agents is vitamin C and E which aloe vera comes with. These two will do a great job taking off years off of your face. In fact, many individuals have reported seeing changes in a mere three months! ​1. Amara Organic Aloe Vera Gel. It is 100% organic aloe vera gel with a purity of 99.7% making it safe for topical use. The packaging is excellent for preventing oxidizing and UV interference. ​2. Earth’s daughter Aloe Vera gel. It is free from paraben and chemicals. This reduces its chances of reacting with your skin. The preservatives used are non-toxic hence do not react with your skin. It comes in a tinted bottle preventing UV rays from penetrating and destroying the gel. ​3. Art Natural Aloe Vera gel. It contains folic acid and vitamin B12, excellent for speeding up cell turnover rate. The packaging is excellent at preventing it from oxidizing or being affected by UV rays. ​4. Green leaf Natural aloe vera gel. The packaging is great at preventing oxidation and UV penetration. It has non-toxic preservatives and thickeners hence not harmful to the skin. It does not leave a sticky mess while moisturizing hence quite excellent at its job. ​5. Fruits of the Earth aloe vera gel. It comes with a thin consistency that makes it easy to spread and does not clog pores. It is excellent for curing acne and hydrating skin. It does not oxidize fast or get affected by UV rays. Amara organic aloe gel is a great choice for a moisturizing gel as it comes with a thin consistency allowing for easy spreading on your skin. It also comes with a purity level of 99.75% and contains no color, fragrance or alcohol making it safe for use on sensitive skin among other skin types. The preservatives used are the usual safe, citric acid, ascorbic acid, and potassium sorbate. It uses Xanthan as the main thickening agent and comes in a cylindrical white flip bottle. Amara Organic does a great as a hair gel, leave in conditioner and after shave. You can also use it on your pets if need be. It can be used to moisturize dry skin, treat acne and sunburns. It spreads easily without leaving residue or clogging your pores. It is great at moisturizing and contains anti-bacterial properties for preventing acne. Can be used for multiple purposes such as hair conditioner, aftershave or for your pets. It contains Xanthan as the thickener. The 8 ounces bottle might be small for your use. Earth’s daughter are known for their great skin care products and aloe vera gel is no exception. Their 12 oz. aloe vera gel comes with a 99.75% purity and is free from parabens, color, petrochemicals, and fragrance. This makes it ideal for use by all skin types. Its main thickening agent is Xanthan while it is preserved using Citric Acid, Ascorbic acid, and Potassium Sorbate, all of which are safe for use. It is packaged in a tinted bottle with a flip lid that allows for easy access to the contents. The bottle also limits the amount of air getting in the bottle hence preventing oxidation from occurring. To add to this, it is organic and cold pressed making it safe for use. The flip lid is excellent at preventing air from entering the bottle and oxidizing the aloe vera gel. It is fast absorbing hence will not clog your pores. It is organic and cold pressed. Xanthan is a synthetic thickening agent. There are better options such as seaweed. Citric acid can make your skin photosensitive. Art natural aloe gel comes with the claim of being 100% pure. It, however, has other ingredients to help in the preservation process. It comes in a tinted, cylindrical 12-ounce bottle that does a good job keeping UV rays at bay. The top of the bottle is flappable making it convenient for accessing the gel without allowing a lot of air in. the main preserving agents are ascorbic acid and potassium sorbate, which are all non-toxic hence not harmful to your skin. The main thickening agent used is Xanthan and it comes with traces of Vitamin B 12 and folic acid that aid in the regeneration of skin cells. This aloe vera gel is great for moisturizing while wading off any bacteria from your skin. It has anti-bacterial properties that are great for preventing acne. It contains Xanthan as the thickening agent which is synthetic. The 100% purity claim might be a little misleading. exclamation-circleCitric acid can make your skin photosensitive. Green leaf natural is another excellent aloe vera gel that does a great job moisturizing your skin. It comes with 99.7% purity and it is organic making it safe for sensitive skin. To add to this, the Green leaf natural aloe gel is paraben free and contains no alcohol, dyes or petrochemicals. This makes it easy to spread on your face without clogging pores or leaving you with a sticky feeling. It also makes it ideal and safe for use by children. Moreover, the making of this product does not involve any form of cruelty to animals hence it is environment-friendly. It is not only meant for your skin but can also be used on hair and as an after shave hence convenient and efficient. It comes in a tinted flip bottle allowing easy access and minimal chances of oxidation. In the making of this product, Xanthan is used as the thickening agent while ascorbic acid, citric acid, and potassium sorbate are the preservatives. It contains no parabens, alcohol or dyes. No animal testing was done while making it. It’s ideal for use by kids and adults alike. The presence of Xanthan is usually frowned upon as it is not organic. The eight-ounce bottle is a little small to last it longer. exclamation-circleThe presence of citric acid can make your skin photosensitive hence the use of sunscreen is important. This aloe vera gel comes in a clear, generous 24-ounce bottle that reveals the pure gel contained in it. It does not contain any fragrance, color, alcohol or paraben hence making it safe for sensitive skin. The Fruits of the Earth Aloe Vera gel is great for moisturizing your skin and providing anti-bacterial protection. It can be great for individuals with dry skin as well as those with oily skin as it does not clog pores. The bottle comes with a pump design preventing air from entering and causing oxidation. The thickening agent used is Carboner 940 while the main preservatives are: Tocopheryl Acetate (Vitamin E), Diazolidinyl Urea .Tetrasodium EDTA, DMDM Hydantoin, and Triethanolamine. It has no fragrance, color, alcohol or parabens. The pump design on the bottle is quite convenient. It contains too many additives which compromise its purity levels. exclamation-circleIt contains Diazolidinyl Urea which can be harmful to your skin. Evidently, aloe vera gel comes with a whole load of benefits for your skin. From the gels mentioned above, our best recommendation would be Amara Organic as it is quite gentle on skin and can be used for multiple uses. While it is impossible to find 100% pure aloe vera gel, you can watch out for any harmful ingredients. For instance, you will be better off going for aloe that does not have any fragrance or color. While preservatives are a necessity in the making of aloe vera gel, they don’t have to be toxic. So go for ascorbic acid or potassium sorbate as your preservatives. Aloe gel in its natural state is not too thick. Some companies add some thickening agents like seaweed which is no big deal but I would place my bet on pure yet thinner aloe gel than the later. Finally, I think this little guide has covered everything you need to know about aloe vera gel. Just in case you have any other questions, just leave me some words below and I will get back to you in no time. Otherwise, enjoy your gorgeous skin thanks to aloe gel. *Related video: How To Properly Use Aloe Vera on Your Skin. Thank you so much for making this list! 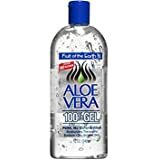 It is such a headache trying to do my own research and figure out which brands actually sell good-quality aloe gel that isn’t full of artificial ingredients and preservatives and tested on animals. This list saved me so much time and energy. Thanks again! This is great advice! I think that I will actually plant an aloe vera plant in the house. Thank you so much for the great article! Aloe vera is highly beneficial to the skin, as it has anti-inflammatory, antifungal, antiviral and antibacterial properties. It also contains within it cellular regenerating properties that are capable of not only regeneration of the skin, but also regeneration of the DNA – which makes it an excellent anti-wrinkle cream, too. It’s believed that Cleopatra herself used the magical plant as a part of her beauty routine. Wow I can’t believe all the useful benefits of aloe vera! Ive only bought it for sunburns but I guess it can be used for so much more. Ive been using a product for acne, a product for moisturizing and then one for scars. Could this replace all three? Also I’m 4 months pregnant and looking at products to help with stretch marks. Will aloe work?